Stainless steel rings are just as lovely as other metals. Stainless steel is an iron and carbon alloy infused with different metals to resist tarnish, rust, and corrosion and to enhance strength. Chromium, nickel, and manganese are frequently used in stainless steel alloys and each component will have a slightly different effect on the resulting metal's appearance and strength. Commonly used in cookware, cutlery, buildings, and medical equipment such as surgical tools and prosthetics, stainless steel has become more popular for jewelry design in recent years as well. Durability: Stainless steel is incredibly strong and scratch-resistant, making it perfect for individuals with careers or hobbies more likely to damage softer metals. Cost: Steel alloys are far less expensive than the strongest precious metals, tungsten and titanium, but have similar durability and strength. Composition: Stainless steel is a hypoallergenic alloy, making it a perfect choice for individuals with sensitive allergies to precious metals. Couples should be aware that some stainless steel alloys do contain nickel, however, which can cause allergic reactions. Environmental Impact: Couples interested in making a personal commitment to environmental awareness may choose stainless steel because it is far more abundant and more easily processed than precious metals that may rely on hazardous and unfriendly mining techniques. 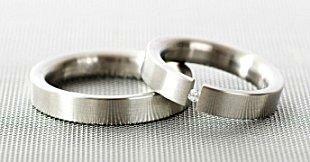 Stainless steel rings can even be made from recycled alloys. A variety of widths suitable for men or women. Carved accents such as tribal symbols, geometric patterns, or cultural accents. Colored inlays, such as black enamel or precious metal inserts - yellow gold is particularly popular because of the vibrant contrast with the stainless steel shell. Textured designs such as basket weave bands, hammered styles, ridges, or cutouts. Gemstones either focused as solitaires or used as accents to an integrated pattern; cubic zirconia is especially popular for stainless steel rings because it is less expensive than diamonds. 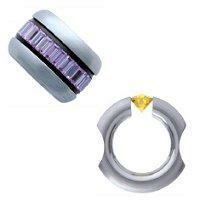 Tension setting designs either with gemstones or without stones to be used in case of resizing. Engravings on the interior or exterior of the ring to add a personal touch. Stainless steel rings generally cost between $30 and $300 depending on the precise style, size of the ring, incorporated gemstones, and other details, making them a great value for couples on a tight budget or who simply want to find a beautiful ring at a more affordable price. Despite the durability of stainless steel, it does need some dedicated care to ensure it stays as beautiful as it is on the wedding day. The ring should be removed during dangerous activities that could cause it to snag on protrusions or to be nicked or scratched (the metal is strong but not impervious), and it should be stored separately from precious metal jewelry that can be scratched by the stronger steel. Over time the steel alloy may lose its luster, but a professional buffing can restore the rich gleam. Stainless steel wedding rings are a contemporary, fashionable choice for couples interested in unique rings for a good price. The ring's sentiment, after all, is more important than the metal it is made of, and a stainless steel ring is sure to last as long as any happy marriage.